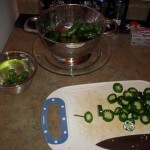 After I made the first batch of jalapeno rings, I started to think that I might want to try and make the jalapeno rings a totally different way. In case I run into any issues with the first batch (such as the rings being too salty). Don’t ask me how, but somehow I ended up on the website for Backwoods Home Magazine, and they had an article about canning peaches. Well within that page they had a link to “The USDA Complete Guide to Home Canning” on the Penn State University web site. 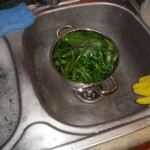 Boil all the pickling liquid ingredients for 15 minutes. 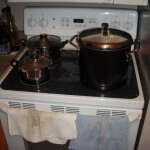 Then set the range burner to its lowest temperature setting to keep the liquid hot. 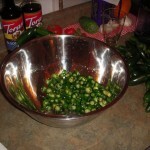 From those ~4 pounds of jalapenos I ended up using 7 pint sized mason jars. 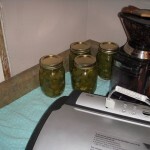 The first batch of canning liquid was only enough for four mason jars. 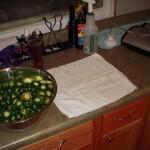 So I had to make another batch of pickling liquid for the final three jars. 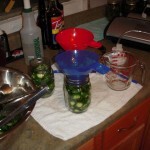 After everything was said and done, I still ended up with about 4 cups of pickling liquid. 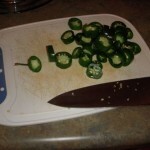 Since I didn’t want the pickling liquid to go to waste, I ended up using part of it for my first attempt at making a Jalapeno Hot Sauce recipe. I’ll let you know how both turn out after some aging. 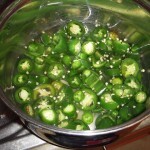 1) I didn’t blanch the jalapenos in boiling water before packing them in the jars. If I did I probably could have packed more peppers into each jar. 2) I processed the jars for 10 minutes using the boiling water method, the same amount of time as my first attempt at jalapeno rings. 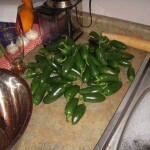 3) I didn’t clean out the seeds from the jalapenos before packing them into the jars, so you get the full heat. 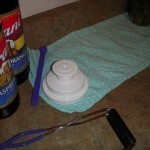 4) I got a mason jar attachment for my food saver, so instead to using a plastic knife to remove the air bubbles from the jar I let vacuum power get the job done. 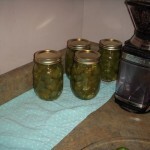 But using a vacuum to remove all the air bubbles from the jar also increased the peppers absorption rate of the pickling liquid, further increasing my need to make a second batch of pickling liquid.